Original title is "Sherlock Holmes versus Arsène Lupin". 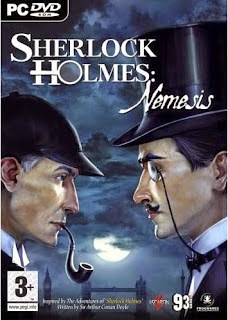 Simpler "Sherlock Holmes: Nemesis" title was chosen for the US and 'some parts of England' release according to WP. Runs nicely at high resolution in Win 7 64 bit without any problems. Textures generally sharp, world a little bare and rigid. Voice acting acceptable, strange pronunciation of a few words including a reference to the Medici. Directed to go get a hansom. No idea what it is, no hints given. Turns out it refers to horse drawn carriages of the time (1800s). They could of at least said hansom cab surely? Maybe this is assumed knowledge from either previous games or the source text. Puzzles are solved through a mixture of pixel hunting and reasoning. Asks players to perform some basic deductions and piece together clues in order to provide key word answers which must be typed. Surprising to see a modern game take this approach but it serves the genre well and forces the player to engage rather than just going through the motions and clicking everything they find. Extensive in-built hint system is also provided. Clues can be revealed slowly with more subtle hints initially. A great idea in the age of the internet where designers must assume people will search for walk through guides rather than bang head against wall until solving puzzles. The balanced approach here is to require engagement for progression but provide unrestricted tools to remove road blocks. It is then up to the player to determine how long to spend trying to solve puzzles before seeking help. Worth another look at some stage. Slow and a little dry, but an enjoyable distraction. 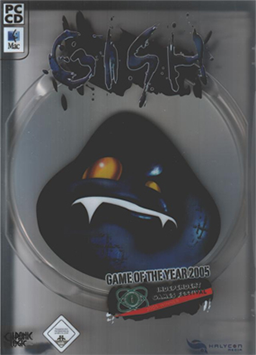 Indie title co-created by Edmund McMillen who went on to create Super Meat Boy, The Binding of Isaac and others. Bland. Some basic platform mechanics and physics combined to create a simple platform/puzzle game. Controls are simple with 4 direction buttons, buttons to turn sticky/slick/heavy, and a jump button. Activating these abilities took some getting used to, maybe partly because I'm so used to playing this kind of game with a gamepad rather than keyboard. The theme and art design really didn't appeal to me. Very bland palette and simply animation. Some fluidity in the movement of Gish himself, but the world is very lifeless. Couldn't keep going passed the first few levels. Interesting contrast with Super Meat Boy which I've played for 2 or 3 hours. I found the controls of that game much more comfortable and direct, and although it is another example of simple art design the presentation had more weight and character. 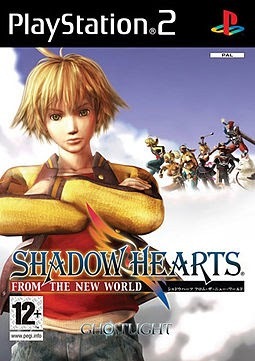 I can see links between these games though, and it's interesting to see where a now well respected designer started. Good luck to him. Voice acting is ordinary, but not excruciating. 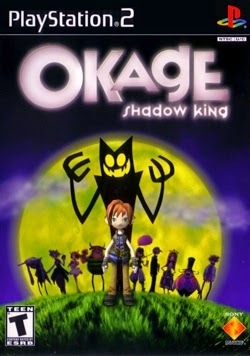 The game is apparently known for extremely bad voice acting in this English release. 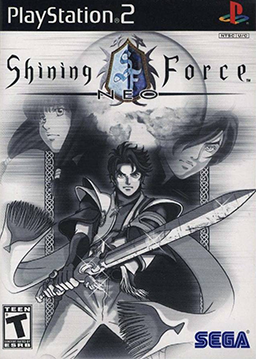 I've never played a Shining Force game until now, despite a strong connection with early Sega and having access to the original games via various compilations. 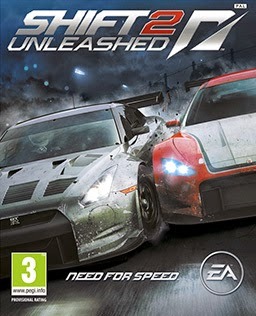 The game is best described as an action RPG with hack and slash Diablo style combat mechanics. It's a well designed game given the platform constraints. Comes across as quite polished and reasonably stylish. The game shows large outdoor areas and seamlessly transitions to indoor environments without interrupting play. Building roofs fade into transparency as the character enters revealing the building interior. This is impressive, and very rare for a game of this vintage, and probably still not a given some 12 years later. 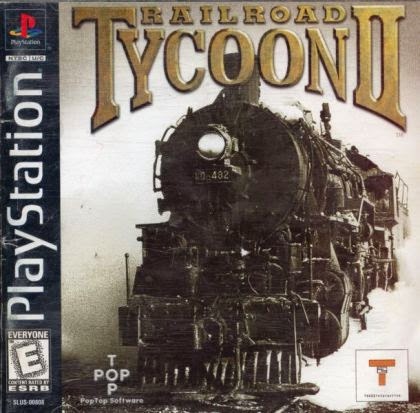 I'm curious about the engine used in this game and whether it was used to power any other games. Story is about young hero returning home, family mystery, protection from ancient power that has re-emerged etc etc. Nothing particularly novel, but competent enough from the looks of things. Mystery and betrayal used to drive things along and retain player interest in the story. Combat mechanics seem simple, but further systems are being introduced as the game progresses. Loot drops from items in the environment as well as enemies. Straightforward but competent real-time action-rpg mechanics make a nice change of pace from obtuse turn based systems iterating on tired decade old ideas. The cut-scenes are well done and very manga-like. There is a bit of a disconnect between the art in these cut-scenes and the art used during the many talking head conversations in game. Differences between in-game character models and pre-rendered cut-scenes is expected but for whatever reason the art used in the conversation talking heads is different again - surely this could have been created to match the cut-scenes? Sad - was looking forward to this one. Main character is a strange kid/private detective. Locations pretend to be 3D areas ready for exploration, but are extremely walled in with very little to see or do. Went through first dungeon which was to explore an old Theatre looking for someone for a client. Story opens up once you complete this. Very bland design simply involving exploration of a bunch of corridors back and forth until events trigger. Real time combat. Party based but player only has direct control over main character Jack. Basic pattern is hitting targeted enemy, dodging attacks, and managing special meter which fills over time and provides power moves. The game looks nice and supports progressive scan 480p. 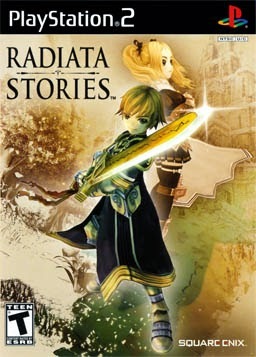 This game like many PS2 titles only supports the progressive scan mode via a button hold at boot. I have no idea why Sony decided support progressive scan only via a (mostly) undocumented button press at boot rather than an in-game menu. There is a sense of humor in the game, nothing overt but enough to convince you that the game doesn't take itself too seriously. The game includes loads of NPCs. It is possible to recruit any one of something like 180 of these into the party. A noted feature of this game is that you can kick anything. World items wobble when kicked sometimes dropping items. People generally react but accept a certain amount of kicking, after which they'll challenge you to a duel if you persist. The field/exploration portion of the game is presented in full 3D but constrains player movement to a restricted area providing a 2.5D path ala double dragon. There are established roads with branching paths allowing players to explore the map. During this exploration enemies will appear along the road providing random battles that can be avoided by avoiding direct contact. Wonder when this was done first? I recall reading that this approach was also used in Final Fantasy XII - not sure when it was established first. Turn based combat with a small party. End game objective: wipe out 7 rival evil kings. The game uses a close level of zoom with characters appearing large on screen. The models look polygonal by todays standards but were undoubtedly advanced for the time period. I suspect the zoom level was chosen to emphasis this - not afraid of polygons - proud of how many! The game engine is capable of showing huge outdoor areas but (as is typical with this era) can only display single rooms indoors and requires a short load from disc when walking between them. Early in the game there was an opportunity to buy some ground beef. This is at a point before there is any context for food or the value of money and so no context had been established for making sense of the decision. I went ahead and as expected it paid off and was recognised by the game with offer to buy the ground beef back from me. I'm not sure how I feel about this sort of interaction as it is entirely out of context with the game world and character motivations. The effect of this design choice is to reward players who are willing to test every interaction and explore every room regardless of the appropriateness within the context of the game. This may appeal to younger players (and probably appealed to me in the past) but it represents pointless busy work that takes the player out of the experience. It could be argued that these issues don't matter in a comical game of this style but even then I'd argue that the game is simply wasting players' time.